The latest "trade hope" rally which sent the Dow Jones up 444 points on Friday, fizzled overnight as stocks in Europe and U.S. futures drifted in thin trading (US exchanges are closed for Presidents’ Day) even after a rally in Asia boosted shares to their highest level since October on delayed catch up to the US. The Stoxx Europe 600 was flat, with the Stoxx 50 little changed on the session, with the Dax declining while peripheral indexes IBEX 35 and FTSE MIB outperformed, as gains in telecommunications companies offset declines in carmakers, after President Donald Trump received a report that may be a preliminary step to raising tariffs on auto imports. The autos index, a bellwether for Europe’s economy, fell 0.65%, also pressured by data showing Chinese car sales fell 16% in January, their seventh straight month of decline, and the biggest one month drop in seven years. “The optimism on trade has been strong, but the underlying economic data has been a lot of weaker - so you have some push and pull factors,” said David Vickers, senior portfolio manager at Russell Investments, adding much focus was now on flash PMI data due out this week. “As the bounce-back from the December lows fades...the fundamentals now reassert (themselves),” Vickers added. 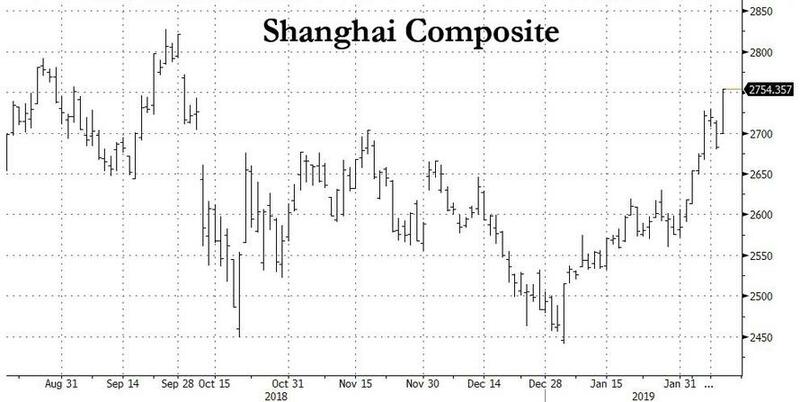 ... while the Chinext and Shenzhen Composite both surged by over 4% after China reported a Total Social Financing credit injection on Friday that was the same size as the GDP of Saudi Arabia, at just under $700 billion. U.S. equity-index futures drifted although were modestly in the green, suggesting that U.S. stocks would hold onto last week’s gains when trading resumed on Tuesday. The Dow and the Nasdaq boasted their eighth consecutive week of "trader optimism" the world’s two largest economies would hammer out an agreement resolving their protracted trade dispute. In addition to trade, bullishness has been encouraged by a continued soft economic data which has fueled expectations that the world’s most powerful central banks could deliver on reflationary policies and provide support for markets. 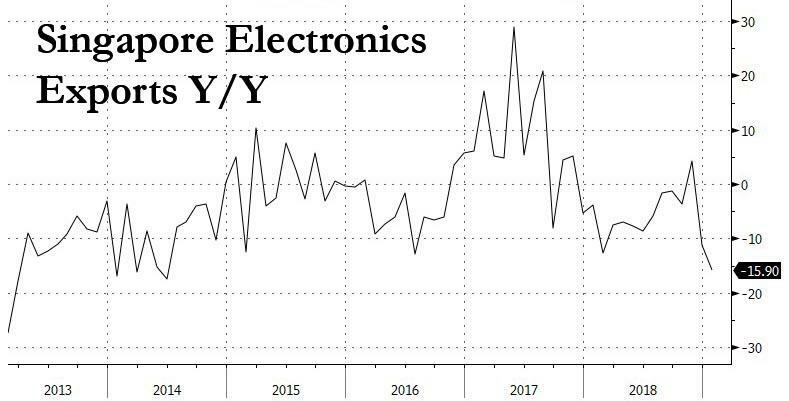 The need for stimulus was highlighted by data showing a sharp slide in Singapore exports and a big drop in foreign orders for Japanese machinery goods. Meanwhile, trade negotiations - whose favorable outcome has already been pried in by the market - will resume this week, with U.S. President Donald Trump saying he may extend a March 1 deadline for a deal. Both sides reported progress at last week’s talks in Beijing. In rate, core European bonds were little changed across the curve, BTPs outperform, with 10-yr Italy/Germany spread 3bps tighter at 266bps. US Treasury cash markets are closed for the holiday. In FX, the dollar was steady on the yen at 110.52, having backed away from a two-month top of 111.12. The yen slipped with the dollar, while the euro strengthened despite dovish comments from a European Central Bank governing council member. The pound strengthened after seven members of the U.K. Parliament said they’ll stand as independents after quitting the main opposition Labour Party over issues including Brexit and antisemitism. Emerging-market assets climbed. 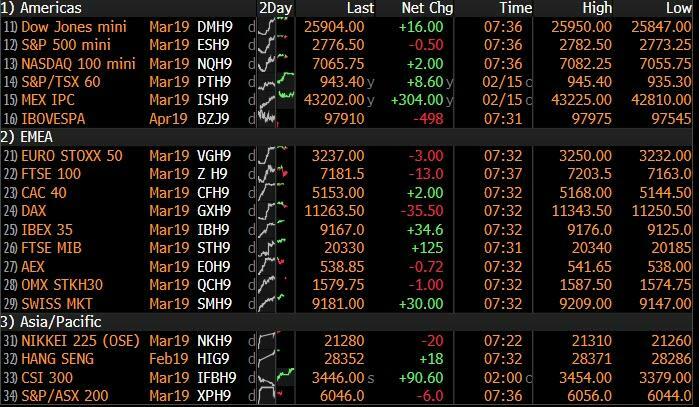 Commodities from oil to copper climbed, sending an index of commodities to the highest since December, with oil prices reaching their highest for the year, buoyed by OPEC-led supply cuts and U.S. sanctions on Iran and Venezuela. Looking ahead, the latest Fed minutes are due on Wednesday and should provide more guidance on the likelihood of rate hikes this year. There is also talk the bank will keep a much larger balance sheet than previously planned. “Given the range of speakers since the January meeting who support “patience,” the Fed minutes should reiterate a dovish message overall,” analysts at TD Securities said in a note.